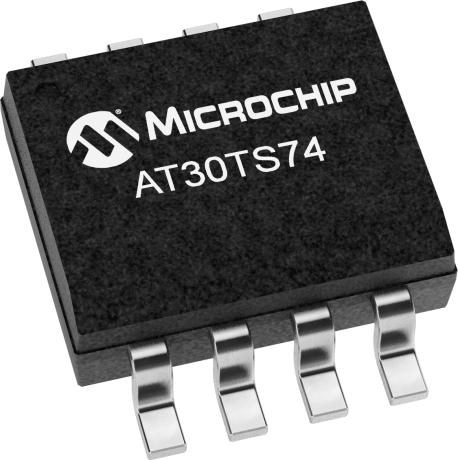 Microchip's AT30TS74 temperature sensor is capable of measuring and converting temperatures from -55ºC to +125ºC to a digital word and provides a typical accuracy of +-1.0ºC over the operating temperature range of -20ºC to +100ºC. The device is factory calibrated and requires no external components to help provide a cost effective solution. To reduce current consumption and save power, the AT30TS74 features a shutdown mode which turns off all internal circuitry except for the internal power-on reset and serial interface circuits. In addition, the device features a power saving one-shot mode that allows the device to make a temperature measurement and update the temperature register and then return to shutdown mode. The AT30TS74 is based on the industry standard "LM75-type" compatible temperature sensor and is a precision temperature monitoring device designed for use in a variety of applications. The device combines a highly accurate digital temperature sensor with programmable high and low temperature alarms, user-selectable resolution up to 12 bits, and an I2C/SMBus compatible serial interface available in compact packages.